How to roast garlic - all you need to know to flavour recipes from Italy. Easy steps in how to roast garlic : our favourite roasted garlic recipe and why it's important in Italian food customs. Simple ingredients for roasted garlic recipe. 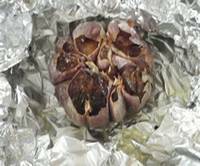 Why learn how to roast garlic? Italian food customs call for garlic to be used when cooking most Italian food. Its inclusion in more or less every dish is what some people put down to the fact that Italian people are amongst the longest lived in the world. Although often recipes from Italy call for chopped cloves, frequently there's a need for a garlic paste or purée. Can you buy it in the shops? - Yes, garlic is sold in a paste form in most supermarkets. Will shop-bought garlic paste taste as good? - Absolutely not. It's massed-produced and tends to be bland and uninteresting - nothing at all like the taste of freshly roasted garlic. Worried about garlic breath? Don't be. This roasted garlic recipe will give you a mellow, buttery flavour which isn't as overwhelming as garlic in other forms. The process of roasting softens and caramelises the garlic and it becomes much milder. 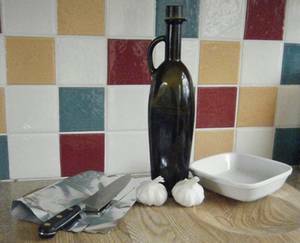 Can you give some pointers as to how to roast garlic cloves from a bottle? Roasting processed 'naked' garlic cloves doesn't work as well because they have no skin to protect them and so they can become quite tough. The creamy consistency produced by this roasted garlic recipe relies on the skin acting like a baking paper. If you've never tried this, even if you think you hate garlic, get in the kitchen and try it today! We guarantee it won't be like any other garlic you've ever had - and given its many therapeutic properties,you'll never get another head cold! cut off the top and drizzle with oil ..
... and roast until tender. This is our own tried and tested roasted garlic recipe - one of our favourite recipes from Italy. Once you've tried it a couple of times you'll be able to adjust it to your own tastes - some people like the garlic slightly less roasted than others. One whole head of garlic per person (or to taste). (This is a 'head'. It is made up of cloves - the smaller pieces). 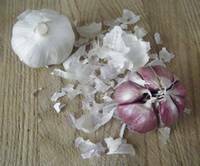 ✮ Take off as much of the papery bits on the outside of the garlic head as possible. 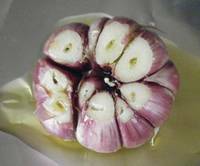 ✮ Cut the top off the pointed end of the garlic so that the cloves are exposed. ✮ Place the head on a square of silver foil, with the exposed cloves facing up. ✮ Wrap the silver foil tightly around each garlic head. ✮ Place on a baking tray in the oven for about thirty minutes. ✮ The garlic is cooked when it's soft to the touch or when you can easily put the tip of a knife into it. ✮ Leave to cool until you can handle it. Squeeze the paste out of each clove, leaving behind the cooked, papery outside. 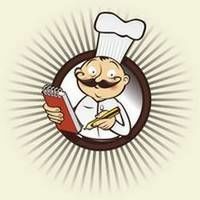 ✮ Use in any recipes from Italy where garlic paste is necessary. One of the reasons to learn how to roast garlic is that many very basic recipes from Italy use it. Here are just a few of the uses of roasted garlic. ✮ The most obvious - eat it by itself! It's one of the popular cold picnic food recipes in Italy. ✮ Spread the garlic paste on lovely crunchy Italian bread - with or without butter - for a great lunchtime filler. ✮ Add to the crusty bread some Italian cheese - goat's cheese, 'pecorino' or 'mozzarella' are particularly good - and spread the garlic on top. ✮ If you're making your own bread, add some paste to the dough for a lovely self-flavoured garlic bread. ✮ Italian food customs use it on 'bruschetta' as a starter before the evening meal. ✮ Make (or buy) a pizza base, spread the freshly roasted garlic on it, sprinkle with 'Parmigiano' (parmesan cheese), grind some black pepper over it and drizzle a little olive oil on top. Great as an appetiser or a late night snack. ✮ To the pizza base and garlic add some other roasted veggies - peppers, courgette (zucchini) slices and aubergine (eggplant) are wonderful. Sprinkle with a little salt and drizzle with olive oil for a tasty 'antipasto'. ✮ Use it to add taste to mashed potatoes or as a filling for baked potatoes. ✮ Add to meat before roasting - make small slits in the uncooked meat, insert the roasted garlic and cook the meat as usual. The garlic infuses the meat all the way through the joint. Delicious! ✮ This will sound a little strange and it's a personal thing rather than any part of Italian food customs (yet!) - but Cath loves this roasted garlic recipe dipped in melted dark chocolate. Yummy!